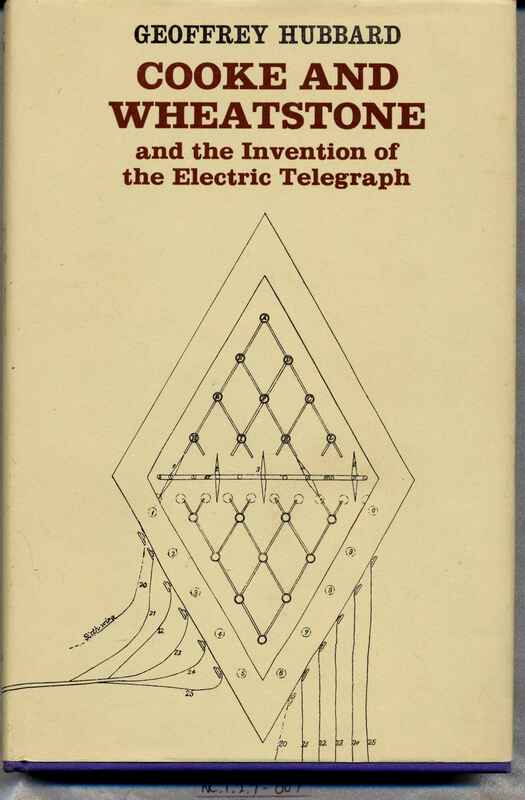 Full Description: A first edition of “Cooke and Wheatstone and the Invention of the Electric Telegraph” by Geoffrey Hubbard, 1963. Publ: Routledge and Kegan Paul, London EC4. 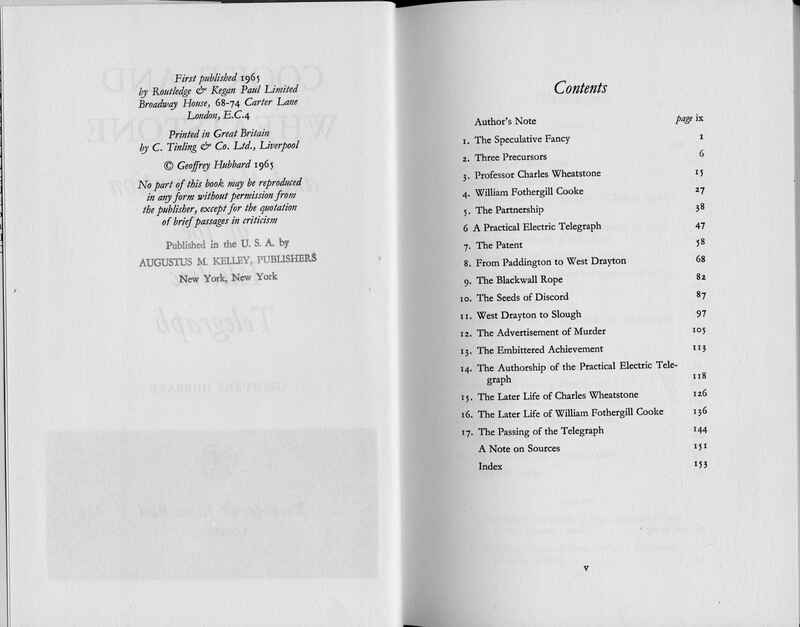 The frontispiece is over-stickered with details of its being a reprint by Augustus M Kelley, Publishers, New York, 1968 (though the Routledge details are beneath the sticker). The facing front page has Kelley’s rubber stamp applied. Probably the most details analysis of the origins of the telegraph and of the Cooke – Wheatstone dispute that so clouded the relationship of its originators. Central to the Cooke - Wheatstone dispute are the original first editions in the Collection of the pamphlets published by Cooke and by his family, pressing home Cooke’s claims to be the inventor of the telegraph: See items NC.1.2.1-001 [http://www.concertinamuseum.com/NC10201-001.htm] and NC.1.2.1-025 [http://www.concertinamuseum.com/NC10201-025.htm] – these publications are much quoted in Hubbard’s writings. 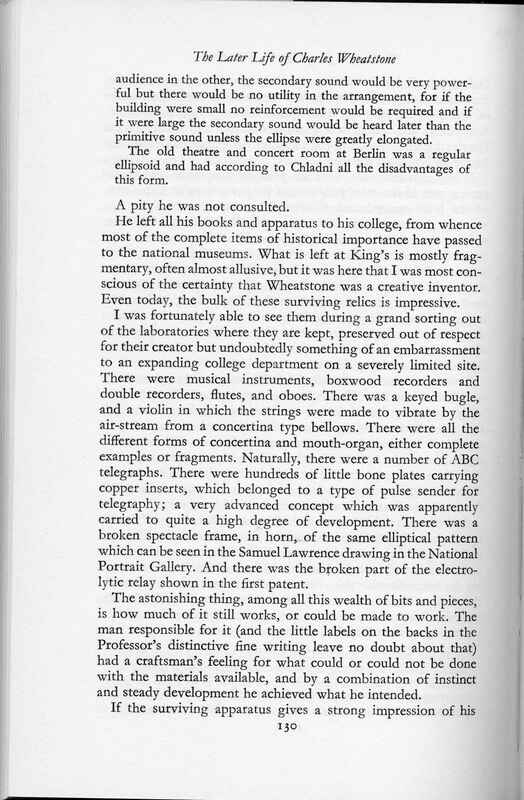 In Chapter 15, pp130-131 “The later life of Charles Wheatstone” the author describes his visit to King’s College in the early ‘60s to see “the bulk of [Wheatstone’s] surviving relics” during “a grand sorting-out of the laboratories where they are kept” and lists many intriguing items as still being present. In later years, Neil Wayne was invited in 1974 by the then Wheatstone Professor of Physics at King’s to carry out a further sort-out of their dwindling and damaged Wheatstoniana, and many musically-related items were rescued and conserved, and are now in the Horniman Wayne Collection [http://www.horniman.ac.uk/music/music/free_reed_index.html]. In 2008, Wayne was approached by a retired technician from King’s who had also been instructed to dispose of remaining Wheatstone material back in the 1960s, and amongst the items he acquired from this gentleman who had rescued them were Wheatstone’s Sheng, Harp-Lute, Samisen, Polariscope, variable pitch reed-Sounding device, and Wheatstone’s open pallet concertina, arguably one of the first to be produced (for research purposes, before instruments were made for sale) which formed the basis of Wayne’s Galpin Society Journal paper of 2009 (Galpin Society Journal Vol LXII, April 2009, pp 235 to 262, entitled ‘The Invention and Evolution of the Wheatstone Concertina’.